Spray foam and Coating systems can solve insulation and weatherproofing problems in industrial and commercial situations. Why not contact us today to arrange a site visit. 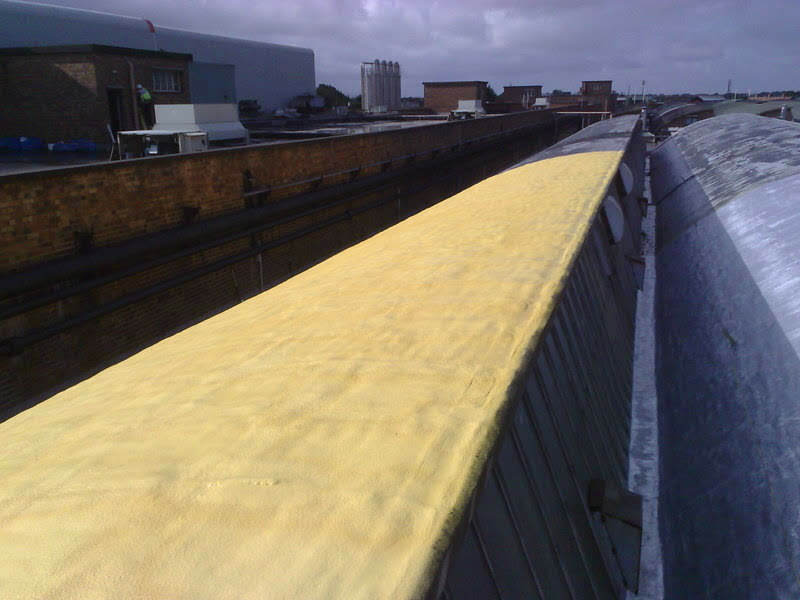 Green Insulation UK industrial roof insulation can be applied to asbestos, metal, aluminium and most other surfaces. Consequently its applications are many and varied. From roof and wall cladding to injection work. Our foam and coating systems can be used to renovate, insulate and stop condensation and is widely used in industry, marine, petrochemical and agricultural environments. Please note that no drilling is necessary for asbestos sheets. These foam systems, tried and tested worldwide over 30 years, have been widely used by Councils, Health Authorities, Banks, Industry and Public Companies and carry a 10 year guarantee. 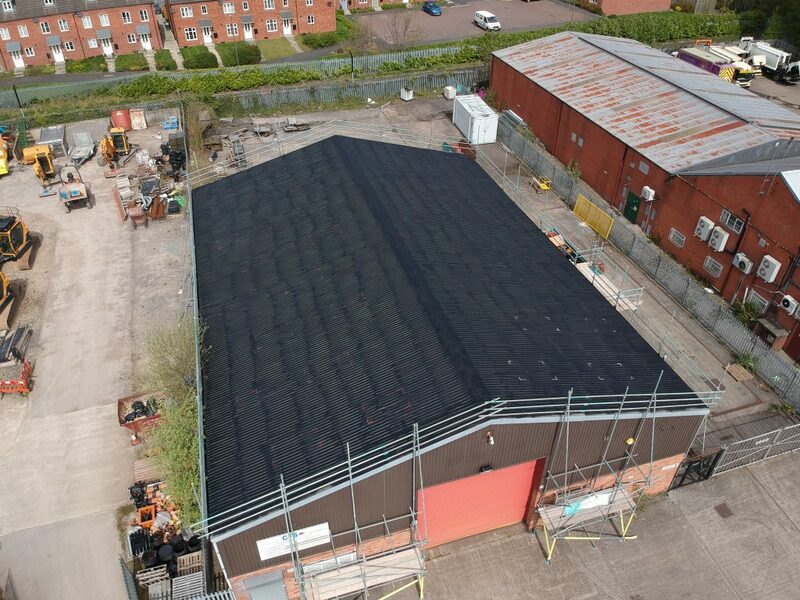 An application of Green Insulation UK rigid foam with a two coat elastomeric membrane to a roof, whatever the existing substrate, gives a seamless, watertight, hard wearing covering which will withstand normal foot traffic. The fact that the foam is spray applied means that it is the best method to seal around trouble spots such as vents, upstands and drainage outlets etc. The roof in the foreground was similar to the one in the background before GIUK application. In cases where foam cannot be sprayed on the underside of roofs or a weatherproofing solution is required we can apply our sprayed foam and coating system externally. This process entails a site survey to establish the suitability of the system for your premises. We will arrange all necessary access and safety such as scaffold, walk boards and boom lifts to comply with Health and Safety regulations. 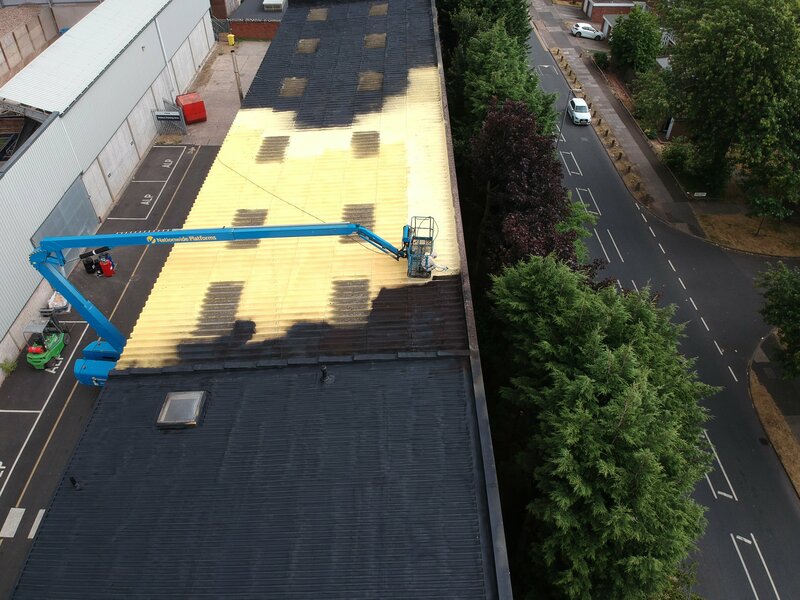 We then clean down the roof surface and carry out any remedial works as required. Once prepared, we spray apply the Green Insulation UK foam to the roof surface, during spraying the material quickly changes from a liquid to a rigid foam, filling all joints and cracks to give a sealed roof. Following the application of the foam we spray or brush apply an elastomeric coating which seals the surface of the foam and protects it from the damaging effects of UV rays. Coating a foamed roof from a boom lift. An unusual shaped roof during the foam and coating process. This multi bay concrete roof insulated and sealed. 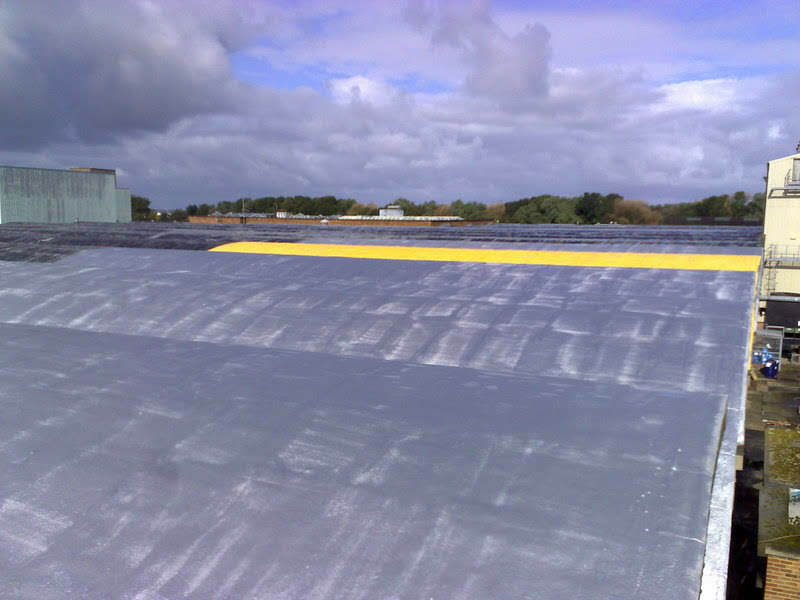 Sprayed Polyurethane Foam (SPF) and elastomeric membranes have been used to solve weatherproofing and insulation roof problems for over 40 years. It was started in the USA and soon spread globally and it has been used in UK for over 30 years. Minimal disruption to the daily operations within the building. No necessity to remove the existing roof. No need to drill through existing roof therefore, no release of dust or dangerous fibres. Sprayed foam expands into joints and cracks and immediately seals them. When coated with an elastomeric membrane, a completely seamless bonded finish is formed. Up to 90% saving on heat loss through the roof. Very lightweight adding very little stress to the roof structure. Strengthens your roof and prevents uplift by strong winds. A weatherproofing system which also saves money on heating costs.